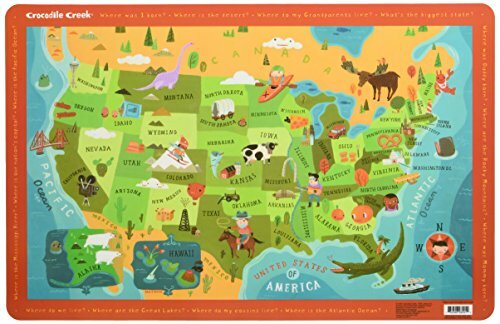 Crocodile Creek's USA Map 200 piece jigsaw puzzle and matching poster will delight all ages. 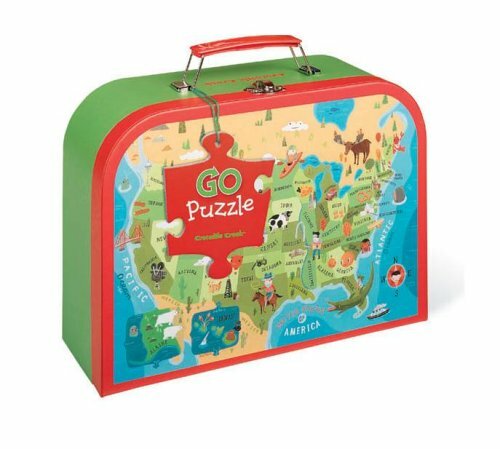 The 13" x 19" puzzle has beautiful, colorful artwork that depicts the United States, its unique states and landmarks for each. The same image is on the poster which makes putting the puzzle together easier. 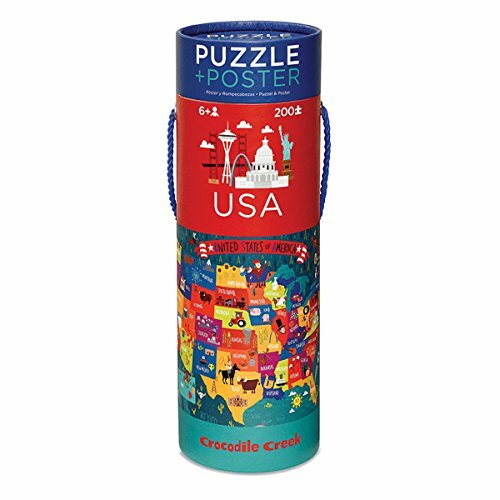 When puzzle is not in use, stores easily in sturdy cardboard cylinder with rope handle. 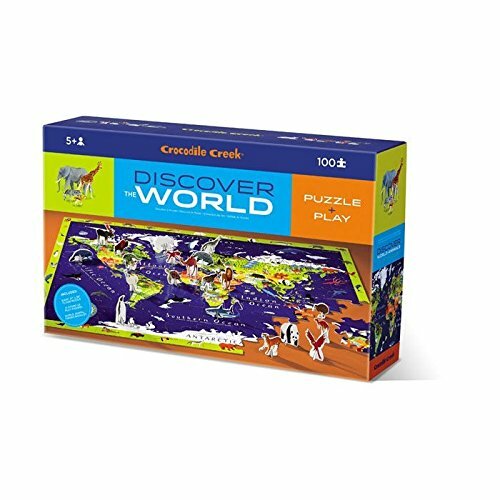 All Crocodile Creek's puzzles are printed with soy-based ink on recycled cardboard. Puzzle can be assembled by individual icon or together as one large floor puzzle. Handy storage case lets kids take the puzzle wherever they go. Each puzzle has rugged pieces that are easy for little fingers to put together. 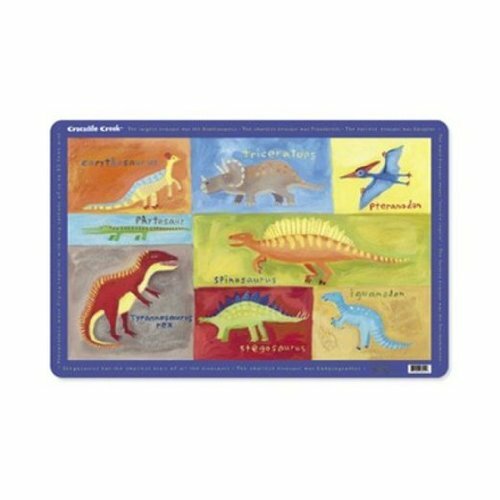 Crocodile Creek Discover World Animals Learn + Play 100 piece Jigsaw Floor Puzzle and 21 Figures, 36"
Finished puzzle size is 19 wide x 13 high. ;200 thick puzzle pieces that fit together well, ideal for kids ages 6 and up. ;Matching Poster is 16 x 24. All stored in sturdy cardboard canister with rope handle. ;Puzzle pieces are made of strong, high-quality blue board that will not tear or break. Printed with soy-based inks. ;Beautifully illustrated and detailed artwork on puzzle and poster. Product Description Eating can be fun! Learning can be fun! 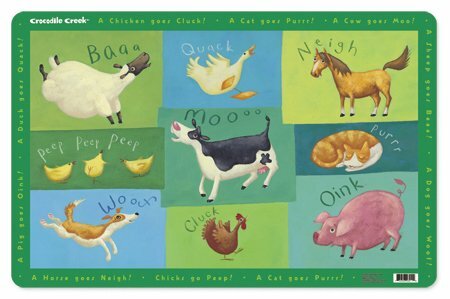 This beautifully-illustrated, educational placemat will bring an extra dimension to mealtime. The border is filled with facts, information and games. Made of durable polypropylene. Easy to wipe clean after every meal. Ages 2 years and up.11"H x 17"W. Vehicle,Barnyard,Dinosaur, Horses, Animals, Jungle 123,Butterflies, Colors of Nature, Natural World,Barnyard 123 or USA Map. Eating can be fun! Learning can be fun! 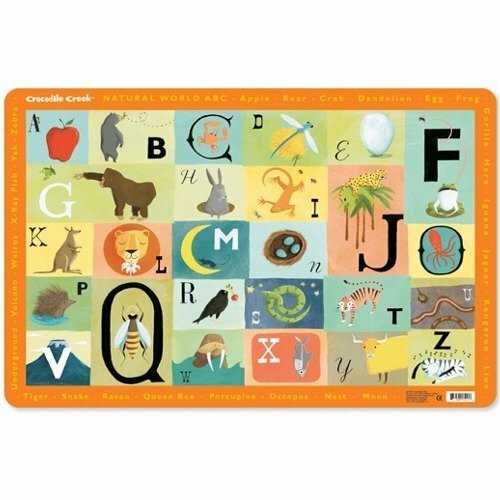 This beautifully-illustrated, educational placemat will bring an extra dimension to mealtime. The border is filled with facts, information and games. Made of durable polypropylene. Easy to wipe clean after every meal. Ages 2 years and up.11"H x 17"W. Vehicle,Barnyard,Dinosaur, Horses, Animals, Jungle 123,Butterflies, Colors of Nature, Natural World,Barnyard 123 or USA Map.